Whether or not you already have plans for Earth Day, there's no better way to celebrate than by grilling out and chowing down on delicious delights, like juicy hamburgers, seasoned chicken breasts, and perfectly-grilled hot dogs. Before you kick off this year's celebration, though, you'll want to make sure you're firing up a grill that is friendly to Mother Nature -- introducing the PGS Grill. For now, let's take a closer look at the PGS Grill and its many environmentally-friendly aspects. There has been a lot of misconception surrounding the use of gas grills. Many people think they are dangerous, and they very well can be when not used correctly and under proper supervision. Did you know that PGS is the only manufacturer of grills that incorporates a Built-in FuelStop® Gas Flow Timer? Even better is that this feature is integrated right into the grill's burner controls. 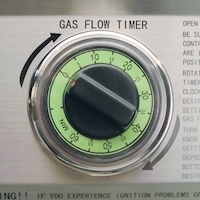 The Gas Flow Timer has helped PGS achieve an ETL certification, which is especially beneficial to builders and property managers who are worrisome about their grills getting left on for hours at a time after tenants are finished using them, which could potentially lead to a gas leak and a subsequent fire. With a PGS grill and the Gas Flow Timer, you can have peace of mind in knowing the grill will automatically shut itself off after 60 minutes. This feature is an excellent way to stay safe and save on your propane or natural gas supply. More so, it can help you cut back on the carbon footprint that you leave behind. 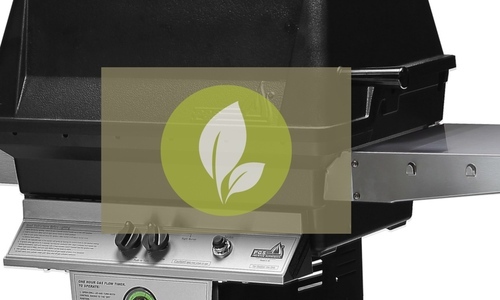 Both gas and charcoal grills leave behind a carbon footprint, but a gas grill's footprint is much smaller, which brings us to the next environmentally-friendly reason you should cook on a PGS grill. A PGS grill makes for the perfect BBQ with a timer. There's one primary issue between charcoal and gas when it comes to grilling and the carbon footprint that they leave behind -- charcoal is dirty. In fact, most charcoal is a fusion of various materials, including sawdust, lighter fluid, and more. When this amalgamation of substances is burned together in the form of charcoal, it tends to leave behind 105 times more carbon monoxide than what gets lefts behind when burning propane. There's no battle between charcoal and gas grills regarding their carbon footprints; gas grills will always win. A researcher with the Department of Energy's Oak Ridge National Laboratory conducted a study comparing the output of gas between gas and charcoal grills and discovered that charcoal only produces 5.6 pounds of carbon dioxide an hour, while charcoal produces a whopping 11 pounds -- both grills were producing 35,000 Btu's per hour. He also studied the carbon dioxide output of electric grills at 35,000 Btu's per hour, and these grills produced an admonishing 15 pounds per hour. So, even though charcoal grills produce less carbon dioxide per hour than electric grills, it's still clear to see that gas grills are far more environmentally-friendly than both of them. When you use PGS grills to delight your guests during this year's Earth Day celebration, you can rest assured you'll be using a grill that was built to last, manufactured with today's top-quality parts and materials. Gas grills are incredibly safe to use, despite many people's beliefs. And whether a gas grill is running on natural gas or propane, it adds convenience to the grilling process by speeding up the cooking process. Even better about the PGS grill is that it uses a highly efficient burner system, which uses heat dispersion to heat and cook food both quickly and evenly; this results in the ultimate green and safe way to serve cuisine that will satisfy everyone's taste buds. PGS grills are manufactured out of heavy duty stainless steel housing and come with a 1-year warranty for parts replacement. If preferred, though, PGS does offer grills that are made out of aluminum. And if you're looking to host a party where you expect a large number of people, you may want to consider one of PGS's commercial gas grills. Combining heavy duty burners with perfectly spaced cooking grids, these grills are ideal for any griller, from beginners to professionals. With a Gas Flow Timer, a smaller carbon footprint than charcoal, and manufactured to last, quality parts, you can rest assured you'll be doing Mother Nature a favor when grilling on a PGS grill.